Extensively-Equipped X370 Motherboard (ATX), with 3x PCIe x16 (x16/x8/x4), 4x USB 3.1 (3× Type A & 1× Type C), 1x M.2/U.2 (PCIe 3.0 x4) & 8x SATA 6G, 10x USB 3.0 / 6× USB 2.0, max. 64 GB RAM bis 3200 MHz, RGB-LED Lighting Motherboards with the AM4 socket serve as the platform for the AMD Ryzen (Summit Ridge) quad-core, hexa-core and octa-core CPUs as well as "Bristol Ridge" and "Raven Ridge" desktop APUs from the A-series with integrated GPUs unlike the old Athlon X4 which came without an iGPU. The advanced AMX X370, B350 and A320 chipsets are aimed at the enthusiast, mainstream and entry-level segments coming with an abundance of modern I/O interfaces and connectors for hardware peripherals, while additional data links are provided by the GPU/APU. The Gigabyte GA-X370-Gaming 5 is a motherboard utilising the ATX format and comes with a lightning-fast 16x PCI-Express 3.0 slot with x16 lanes and a x16 slot which is connected to the chipset via eight lanes. Furthermore a PCIe 2.0 slot with a x4 connection as well as three PCIe x1 slots are available for additional expansion cards. As an X370 motherboard the Gigabyte GA-X370-Gaming 5 also supports AMD's Crossfire- and NVIDIA's SLI technologies for multi-GPU setups. The four RAM slots can accept up to 64 GB DDR4- RAM at a maximum speed of 3000 Megahertz. The range of internal connectors includes, among other things, two USB 3.0 headers and two USB 2.0 headers for four ports each respectively as well as TPM-, Clear CMOS-, COM Port- and LPT- headers. Data storage devices like SSDs and hard drives are managed on the board via eight SATA 6G connectors (incl. RAID-Support) as well as a U.2- M.2 slot which is connected via four PCI-Express 3.0 lanes to supply high speeds of up to 32 Gbit/s. b>M.2-SSDs measuring from 42 to 110 mm in length can be used and furthermore the cutting-edge NVM-Express protocol is supported which has been specially optimised for the highly-parallelised data access of modern PCIe-SSDs. A further highlight of the Gigabyte GA-X370-Gaming 5 is to be found to the rear of the motherboard on the I/O shield which includes a USB 3.1 Type C port. The new style of USB Type C is particularly thin and can finally be inserted in either direction. USB 3.1 or USB 3.1 Gen 2 reaches maximum speeds of 10 Gbit/s per port. Furthermore, the Gigabyte GA-X370-Gaming 5 includes integrated RGB-LED lighting and also two Gigabit LAN ports. Last but not least five fans with 4-pin PWM connectors can be directly connected to the motherboard. The rear of the motherboard also supplies compatibility with USB 3.0 and 2.0, universal PS/2 as well as five audio jacks and a S/PDIF output for connecting 7.1 sound to the Gigabyte GA-X370-Gaming 5. The APU-GPU (optional) display output also comes with HDMI compatibility. More links for "Aorus GA-AX370-Gaming 5 AMD X370 (Socket AM4) DDR4 ATX Motherboard"
"A well-balanced offering with superb RGB LED and fan control capabilities as well as solid stability throughout our testing." "I find no single area for change or improvements. Features here are near identical to the flagship boards from the other brands. But this is a good 50-60 pounds less. Unless you plan to do some serious LN2/benchamrking runs, this is the logical choice for a higher end AM4 system." 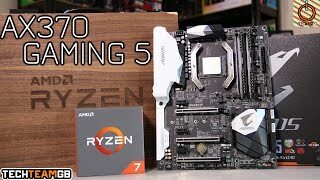 "...along with some solid benchmark numbers and most of the features you need to build an awesome Ryzen system, the Gigabyte Aorus AX370-Gaming 5 is currently our firm recommendation for an AM4 motherboard at around £200." "The AORUS AX370-Gaming 5 motherboard shows what the full unadulterated X370 experience is all about. There is an abundance of connectivity and storage options, custom lighting effects, and a near endless list of GIGABYTE exclusive technologies. If there is anything else you can think of that will make a motherboard better, GIGABYTE has added two of them." "The Gaming 5 looks fantastic with the ice white heatsinks standing out starkly from the black PCB and giving you a canvas to make the most from the excellent Aorus lighting to really stamp your personality on your system, thankfully considering how many lights there are on the board you can also completely turn them off too." "The Gigabyte Aorus AX370-Gaming 5 is a fine motherboard, ideally suited to Ryzen 7. Those in search a premium AM4 experience, however, would do well to put this board on their shortlist."